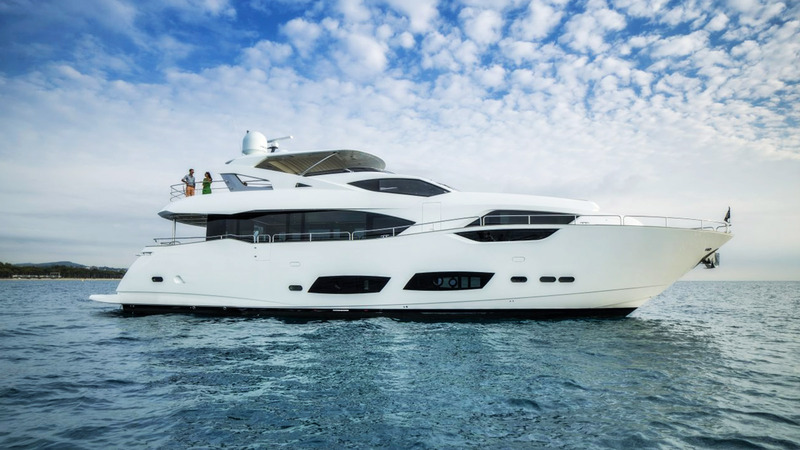 A near-new Sunseeker, only delivered in 2017, Nitsa promises an exceptional charter experience thanks to her spacious interior and exterior spaces, stylish design and abundance of water toys. Able to welcome eight guests in four well-appointed cabins, Nitsa carries four experienced charter crew who will ensure her guests have an unforgettable charter vacation. A true performance-focused design, Nitsa cruises at 22 knots, reaching comfortable top speeds of 26 knots, with zero speed fin stabilizers for added comfort. Boasting a neutral, classically modern interior, charter guests will delight in the large-light filled spaces and will feel relaxed from the moment they step on board. The main saloon is a large space including a full formal dining table, to enjoy gastronomic feasts, with the galley and pantry nearby for easy service. A full entertainment system with two large TV’s, casual seating, drinks cabinet and stair access to the raised pilothouse completes the picture.